For those who’ve been following this series, you know that almost without exception, I recommend that you spend your money on horses (or things for horses). Epsom salts are one of those things. You should definitely have some on hand in the event that you need to make a hoof poultice. Or put some in a bath. Your bath. Because sometimes you need to spend a little money on yourself. Since you can buy epsom salts for about 75 cents a pound, they fall quite nicely into the “little money” category. If you’re going to take advantage of this miracle concoction, you need a tub. If you’re a dedicated “shower person,” I’ve probably already lost you. But if you’re a rider or someone who keeps or cares for horses, I’d like you to consider what epsom salts can do for you. Admittedly, it’s easier for those of us who are “bath people,” even if we are a bit anomalous on this side of the ocean. I’ve been lucky to have lived in old houses for the last twenty years, all with cast iron bathtubs that hold the heat and in which I can immerse myself. During those twenty years, I’ve put a lot of stuff in the bathtub. Essential oils. Non-essential oils. Mustard powders. Fragrant fizzes. Bubble bath. Epsom Downs is in the same area responsible for Epsom Salts -- coincidence or not? 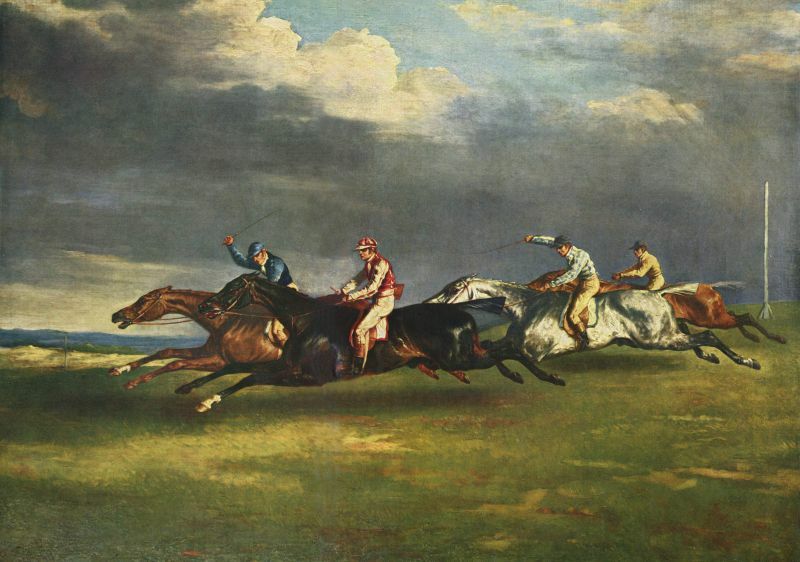 The painting is by Jean Louis Theodore, entitled The Epsom Derby, completed in 1821 and housed in the Louvre. When it comes to aching muscles, there’s nothing like an epsom salt bath. And there’s nothing like having a weekend like the one I just had to make me grateful to have epsom salts in my world. In case you’re wondering what kind of weekend that might be, it’s the kind in which your sister drops off her English Setter, who can’t go off leash and needs to be walked several times a day, for a total of two hours…your boyfriend appears to have gotten blood poisoning from an immunization and needs to be in and out of the ER having intravenous antibiotics…you don’t have the strength yet, even though you broke your back eight months ago, to do everything your boyfriend normally does for your horses at home, while he waits for you to be 100% once again, but you have to do it anyway. The good news is that the weekend is over, my boyfriend is fine, my darling (and strong) ex-husband came to help me add muck to the compost pile, and I had epsom salts. I should mention that if you do see a “red line” on your body from a puncture of any kind (including a needle), you need to hike it over ASAP to the ER. I found that out the hard way several years ago, when my boyfriend broke up a fight between our deaf cat, his daughter’s blind cat, and our semi-feral cat, who bit him in the heel. A google search told us that as long as he got to the doctor within three to six hours, he’d be fine, so we walked through the doors of the ER (it was a Sunday) in three. The doctor on duty told us we were about three hours late…that anyone who gets a cat bite needs to come into the ER right away. That time, IV antibiotics didn’t erase the red line…it just kept growing…and he ended up in a hospital room for three days. That’s what scared me when I saw the red line last weekend. But we were lucky. By the time I took my epsom salt bath last Sunday night, the pain and redness had subsided in my boyfriend’s arm, the horses were all tucked in, my sister’s dog was bedded down for the night in the kitchen, and I knew the limits of what my body could do. Epsom salts to the rescue! There’s nothing like epsom salt baths for taking the aches and pains away — both the ones you have and the ones you’ll feel the next day if you don’t take an epsom salt bath. Epsom salts are the cheapest physical therapy around. I just picked up another milk carton container at the grocery store, with 4 pounds and numerous baths to enjoy, for $3.19. Who needs a massage? Well, I do. But for now, I’ll be uncharacteristically thrifty, and stick with the salts. Let me tell you something about Epsom Salts. When you live here (yes, I live right here, in Epsom) everything — and I mean absolutely *everything* has “Epsom Salts” in it. You brush your teeth with it, you shower in it, you bathe in it, you drink it, you make tea with it, you wash your clothes with it… ARGH. You have NO idea what “Hard Water” is, until you’ve lived in Epsom. I have to filter my water to make coffee, or I have a chalky, milky white film on top of my cup. I use Calgon (descaler) in my washing machine with *every* wash. I throw out at least two kettles a year. Anything that has water near it, or stands in it for a period of time, ends up with a white scale on it. I need twice as much soap as anyone with “softer” water. You should have seen what happened when I went home to Germany a few years back, not paying attention and just going with as much shampoo as I normally use here in Epsom. My parents have very *very* soft water. There was foam…everywhere lol. The stuff is a menace lol. Oh my goodness Silke! I consider my education in Epsom Salts to now be complete! Wow, and I thought those of us living in New England had hard water! I have always loved using epsom salts. I use it for any wounds on myself or on my horses, it helps tons to remove infection. I also have to say cat bites are horrible. I work with dogs and cats for a living and have luckily only been bit once by a cat. Though I got no infection thankfully, but I still support the scar! Arnica. Also- worst weekend ever. I hope you’re doing better now. Arnica! I know that’s part of why Sore No More works so well. Thanks for the reminder. And yes, I things are back to normal…as normal as they can be!